Conversion of a 200m2 flat into 3 separate flats. Our client inherited a 215 sqm apartment built in the early forties in the city centre. In the current economic climate it proved too big to sell or to rent out. 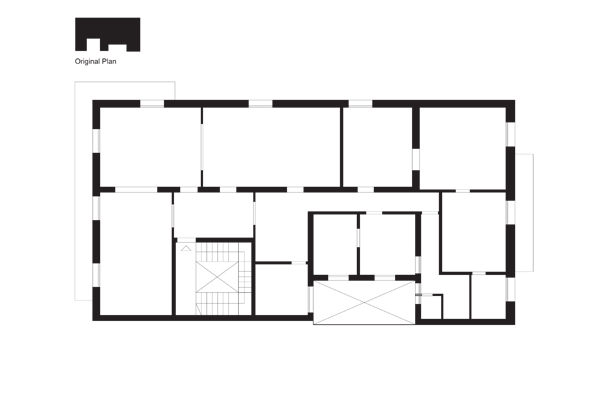 The problem given by the sheer size of the apartment was solved by dividing it into three smaller units (35, 70, 110 sqm) thus giving the owner a range of units suitable for different types of tenant (singles, young couples, families). Additionally the full investment cost could be recovered by selling the smaller flat, if required. The original entrance hall was turned into a shared access area for the three new units. The new layout is designed so that each apartment has at least one balcony. Once the perimeter of all the units was defined, the interior space was subdivided to maximise the light and to introduce new functional elements. Inexpensive materials were used creatively to obtain a strong graphic effect and sophisticated look within a limited budget.